You could just do that and get an adequate low-carb side dish. It might be a bit watery and taste not so great, but at least it will be low-carb. But what if you want mash that’s light, fluffy and scrumptious? An equal companion to your delicious meat, fish or sausages? A dish to enjoy for its taste, as well as its low carbs content? Cauliflower can deliver. You just need to know a couple of simple tips. 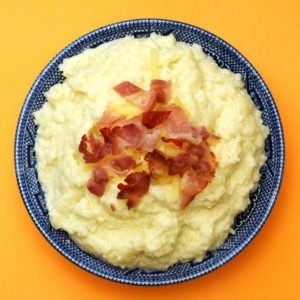 Here’s how to turn boring basic cauliflower mash into a truly delectable dish. Fresh cauliflower works much better than frozen for mashing. Both texture and taste improve when you use fresh. If you can, get the whole head of cauliflower rather than pre-cut chunks. It will stay fresh longer this way. Cauliflower is a durable vegetable – it can last for several weeks in the fridge. Most cauliflower mash recipes start with boiling cauliflower. But cauliflower absorbs a lot of water during boiling. The texture of your mash is already doomed. You are advised to squeeze excess water out, but that only helps a little, and anyway, who needs the extra hassle? Steaming is a much easier way. Cauliflower gets cooked without being watery. Use a steamer if you have one (steaming is great way to cook most vegetables and fish, so a steamer is well worth considering). If you don’t have a steamer, get a small pot of water, metal colander and a lid or a plate to cover it. Steaming takes about 10 minutes. If you like your mash to be really dense, you can squeeze some water out of your cauliflower even after steaming. I usually don’t bother, and it comes out about the same texture as mashed potatoes. A generous amount of fat is the secret to making cauliflower taste scrumptious. I add about 1oz (30g / 2 tbsp) each of butter and double cream (that’s heavy cream in the USA) per 1 head of cauliflower (1lb / 450g). The cream is important. It adds rich smooth tones to the taste, but also lightens up the texture and makes it more fluffy. Powerful modern food processors and blenders are great time savers. But they are not the best choice for cauliflower mash. I love my Blendtec. But it pulverises poor cauliflower into the complete oblivion. Texture becomes liquidy and lifeless. For better results, use a hand blender – or even a manual masher. This gives you more control over texture, so you don’t overdo it. It creates a more natural, fluffy and light mash. If you must use a food processor, choose the gentlest possible setting. They take a little longer to cook than cauliflower, so steam separately and start them first. Each has a strong taste that would interact with cauliflower to make something completely new. If you follow all the steps above, you will end up with a lovely simple side dish that goes well with anything. Don’t settle for bland watery cauliflower mash! Use these simple tips to make it wonderful. 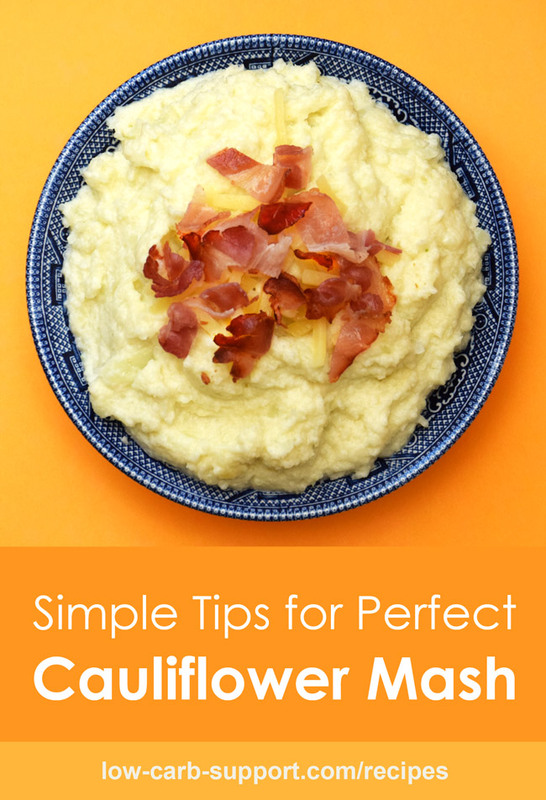 Do you have a tip on making cauliflower mash? If you have any further tips, please share with us in the comments below. Cut the cauliflower in chunks. Steam them in a steamer or colander over boiling water for about 10-15 minutes (depending on the size of the chunks). Keep checking softness with a fork or a knife. Cauliflower needs to get soft – about the same as boiled potatoes. When ready, put your cooked cauliflower into a bowl. 20 Low Carb, Paleo and Primal Side Dish Recipes. Roast 2 red peppers, dozen tom’s and 2 small onions with olive oil. Thanks for the tip! Sounds yummy, I will definitely try it.